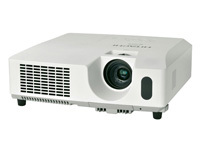 Our projectors are suitable for either data projection or movie nights. We are one of the few Sydney suppliers that hire high definition projectors. You can connect them to PC compatible laptops, Mac computers or DVD and BluRay Players. We provide VGA, HDMI cables and adapters as required. The lumen ratings determine the projector's brightness. Typically a 2200 lumen projector is suitable for dark to medium lit rooms, while 3200 lumen projectors are best suited to use in daylight situations or brightly lit rooms. We can advise you on the best projector and screen solutions for your venue. Prices are based on pickup from us in the Eastern Suburbs. The projectors are "plug and play" and easy to set up. We can quote on delivery anywhere in the Sydney area. If you are hiring for a movie night, we can offer a speaker system for an additional $50. We have HDMI and VGA connectors. They are included in the hire. 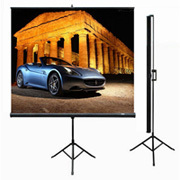 Our portable tripod projector screens will fit into most cars for ease of transport. Their 1:1 gain means that there is no loss in the intensity of the projected image. Aspect ratios can be adjusted from 4:3 to 16:9. Image size depends on the distance of the projector from the screen. Typically the distance ratio is 1:2. This means that for a 100" (2.5m) diagonal image, the projector will need to be 3m away. We are happy for you to pickup the 100" screens, but our 120" are kept for special occasions (eg weddings) and we need to keep them in spotless condition. We therefore only accept orders where we deliver.